To publish a print magazine or to go strictly digital: it’s a topic debated not only by alumni and development departments within universities, but by brands and publications around the world. While so-called experts have warned for years that print is dead and traditional magazines will be the first to go, print magazines — particularly those that cater to niche interests — seem to be making a decent resurgence. Media industry rhetoric aside, though, what is the best way to communicate with your institution’s alumni: print or digital? According to recent industry data and a handful of case studies from frontrunners in alumni publishing, you just might need both. First, the data. CASE’s 2013 study, “Alumni Magazine Readers: National Survey Results” shines some light on alumni preferences in the battle of paper versus pixel. Alumni of all ages prefer print magazines (with a side of digital). The clear verdict is that print still rules in the realm of alumni magazines, with 66% of readers of all ages preferring to read a traditional print piece. As you may have surmised, the older an alum is, the more likely he or she is to prefer the print format. 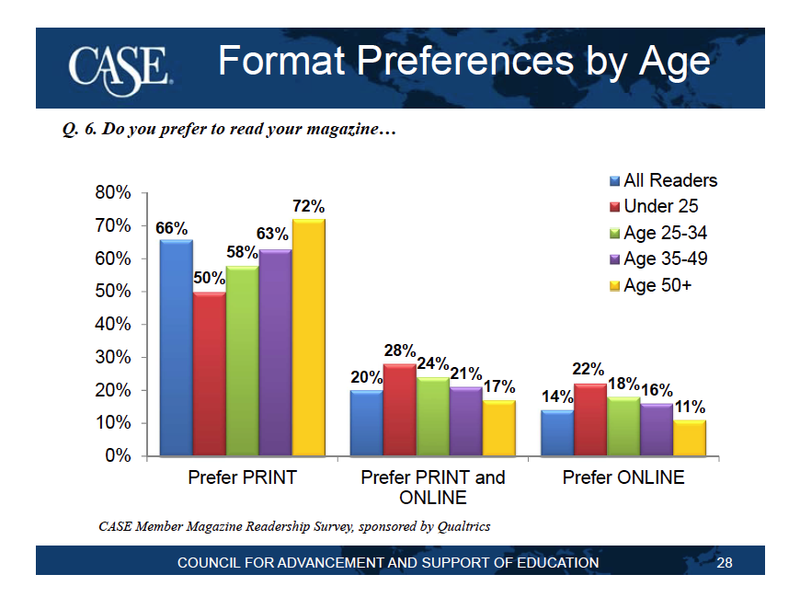 Still though, no less than half of alumni under 25 opt for print over digital. That’s not to say that no one reads the digital versions of alumni magazines, though. One in five readers prefers to have both a print and an online version of their alumni magazine available, and a decent percentage of readers at each age level are only interested in a digital magazine. 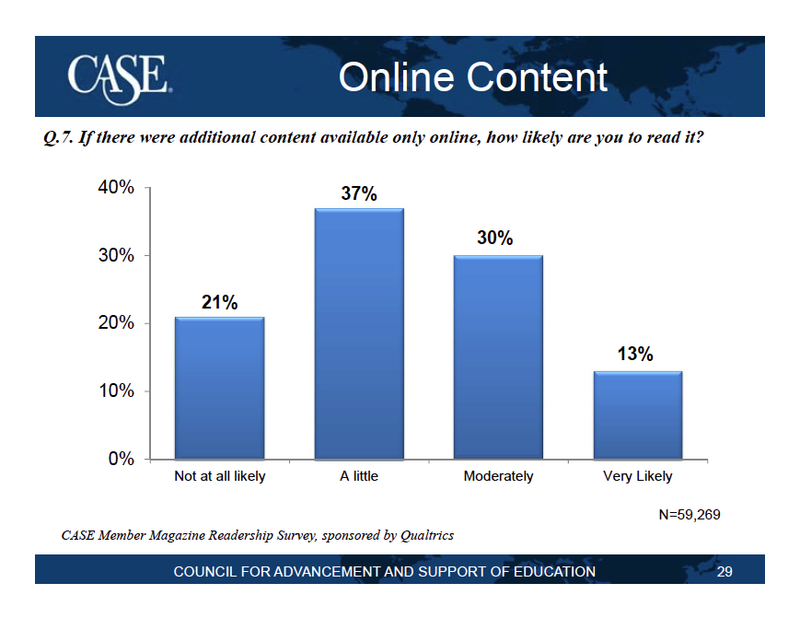 Most readers would go online to access additional content. While 21% of readers say they are “not at all likely” to read additional content online, the rest of respondents would consider checking out unique digital pieces. How can print and digital magazine content work together to enhance and extend communication between institutions and alumni? While it’s easy enough to duplicate print content for the web — either as a downloadable PDF or by retrofitting that content into a digital format — this solution doesn’t give alumni much incentive to extend their interaction across platforms. A unique online magazine presents your institution with the opportunity to leverage the full spectrum of digital media — to evolve the online alumni magazine experience into something else entirely by offering experiences that paper cannot. From subtle scrolling animations to video and open online discussion of magazine topics, many alumni and development departments are innovating the digital alumni magazine model to give readers a reason to read print and digital. 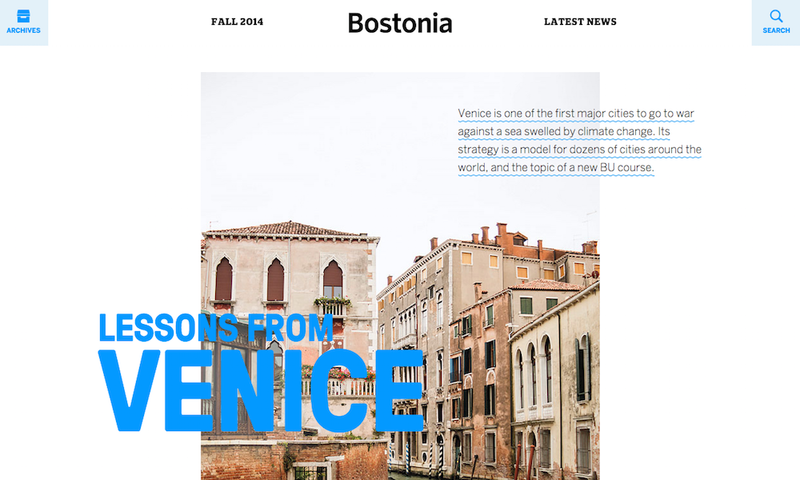 Bostonia uses a combination of video and scrolling animation to make stories feel fresh and web-friendly. In the article “Lessons from Venice,” for example, wave-like illustrations placed throughout the text (fitting for the article’s water-themed topic) ebb and flow as the user scrolls down the page. Readers are also prompted to watch a video with on-location accounts of student and faculty work in Venice. Like many online publications, Bostionia allows readers to comment on articles, which introduces a new way for alumni to offer opinions and reconnect with their institution and former classmates. Also from Boston University is Everett, a magazine named for the School of Management’s founder. 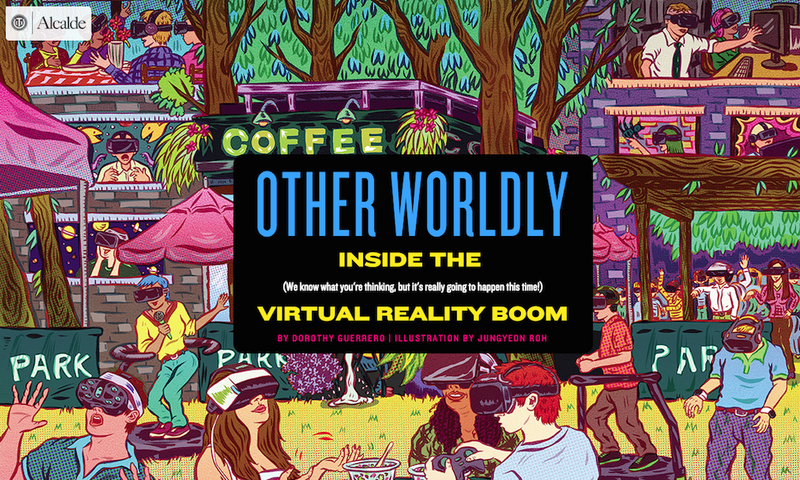 One of the most prominent features on the magazine’s home page is the “browse by” navigation, which invites readers to re-sort that issue’s content based on her interest — either leadership, marketing, or sustainability. This simple tool lets users build a customized version of each issue with the click of a button. Alcalde runs a regular series of interactive features comparable to the New York Times’s “Snow Fall” or ESPN’s “The Long Strange Trip of Doc Ellis.” UT uses interactive details — pull quotes that fade in, images that pan, and videos that demonstrate specific article concepts — to elevate the story beyond what a static print piece can offer. The stories inside University of Texas at Arlington’s magazine are equally interactive. Many of the pieces incorporate video into the header to pique reader interest right off the bat. Stories also use a variety of interesting templates so that no two pieces look the same.